Veteran WR Larry Fitzgerald was the top fantasy point scorer in Week 2. DFS players went chasing Carlos Hyde points, and we all know how that worked out. WRs Antonio Brown, Julio Jones, Jarvsi Landry and Terrance Williams were the next 4 most owned players on DraftKings Week 2. Ben Roethlisberger was the top QB, rookie Matt Jones was the best RB, Rob Gronkowski was the top TE and the Browns put up 20 points against the Titans. As usual, the NFL was impossible to predict last week. Week 3 will see people chase Travis Benjamin and Johnny Manziel hooking up on a long TD, but the Browns have made it known that if Josh McCown is good to go on Sunday, he will be their starting QB! In Week 1, DFS players were good at finding value plays. 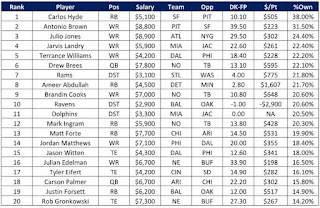 The New York Jets were owned in 19.6% of lineups, Chris Ivory 17.4%, Jason Witten 14.1% and the Seattle Seahawks 11.3%. But once we had actual stats on paper and saw teams play, the thought process changed and in Week 2, not one of the top 20 value plays was owned in more than 6.8% of lineups. That guy was Donte Moncrief. Larry Fitzgerald was the only other player on the list owned in more than 5% of lineups. ﻿Of the top 10 QBs owned, only Ben Roethlisberger and Tom Brady finished as a top 10 scorer at the position. The NFL is hard to predict but I didn't realize it was THAT hard! Danny Woodhead was the only RB to be one of the top 10 RBs owned, and finish as a top 10 scorer. Oddly enough the position with the most options, WR, had the highest percentage of players to make both lists, at 40% - Antonio Brown, Julio Jones, Julian Edelman, and Odell Beckham. 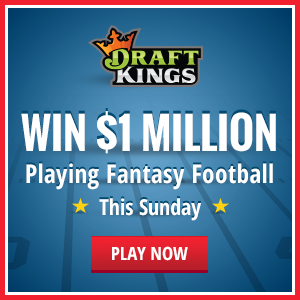 Spend your money on big time WRs and you have a great chance at being rewarded! TE also had 4 players make both lists - Rob Gronkowski, Tyler Eifert, Greg Olsen and Jordan Reed. 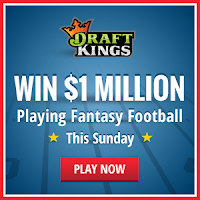 They say Daily Fantasy Sports is not gambling, and I hope most of us don't actually try! Of the 10 most owned defenses, only the Arizona Cardinals and Philadelphia Eagles finished among the top 10 scoring defenses!